A yummy veggie filled meal or side for your meaty main. 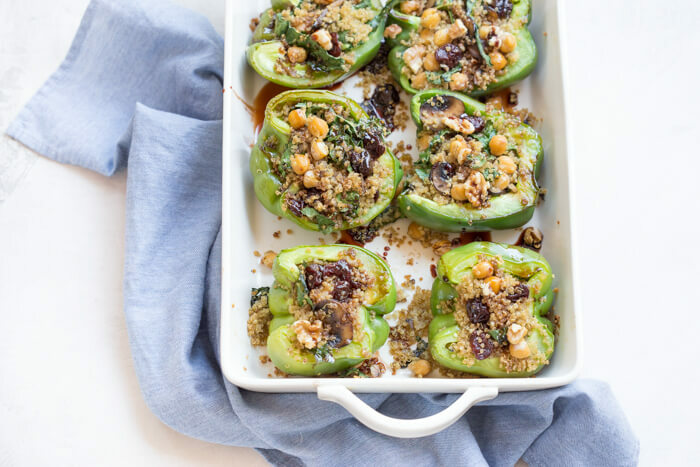 These Vegetarian Quinoa Stuffed Peppers filled with quinoa, mushrooms, kale and dried tart cherries and topped with walnuts and a tart cherry reduction. Talk about flavor bomb. 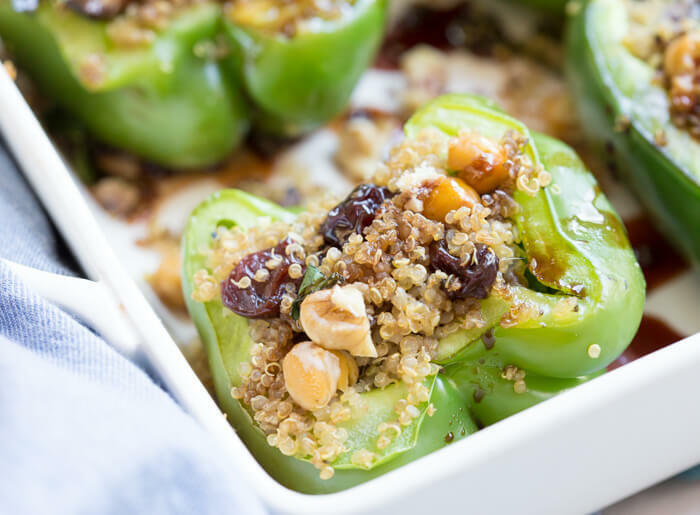 If you’re looking for a vegetarian friendly dish that is comforting and nutritious– these Vegetarian Quinoa Stuffed Peppers are it! Sweet and savory. A little tart and a tad bit nutty. 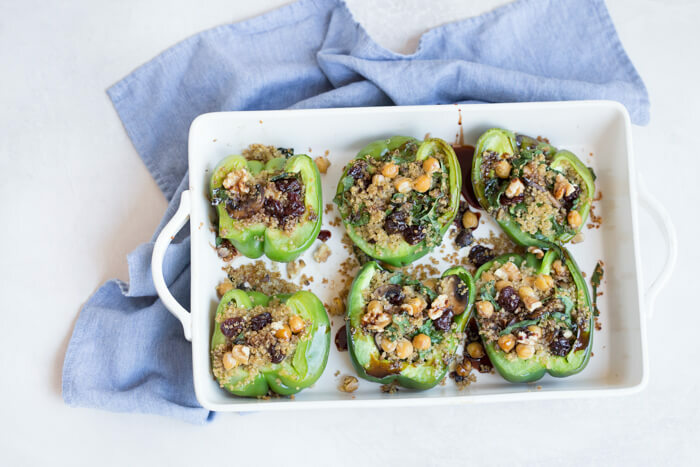 I love everything about these Vegetarian Quinoa Stuffed Peppers. This is a recipe that I developed for the Cherry Marketing Institute, because I have a deep love for Montmorency tart cherries and the exercise recovery aspect that the fruit provides seals the deal. Less muscle soreness post workout, I’m in! Need all the help I can get lately with CrossFit workouts that leave me sore. I’m all about protein when it comes to recovery too. are packed into this recipe for a yummy vegetarian sources of protein. Pair this up with grilled chicken or turkey or serve it as a stand along entree if you’re vegetarian or vegan. 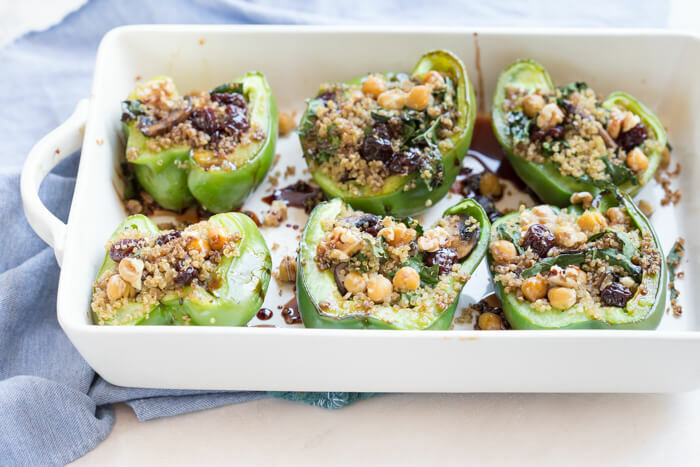 If you want to make this recipe even quicker, stir in 3 cups cooked quinoa for the dry quinoa called for in this recipe (omitting the vegetable broth of course)… shaving 20 minutes off the cook time for these Vegetarian Quinoa Stuffed Peppers. 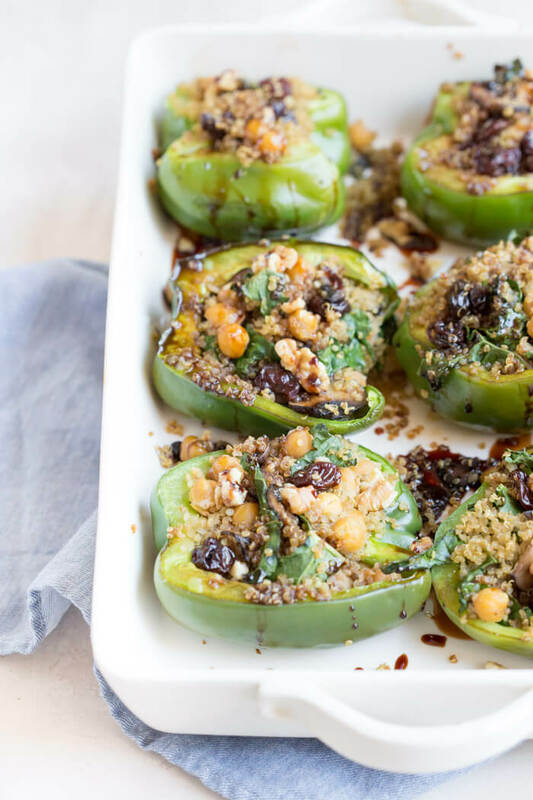 For more vegetarian yummies like these Vegetarian Quinoa Stuffed Peppers, check out Love & Zest’s Vegetarian Recipes and follow my Vegetarian Pinterest Board. Preheat oven to 350 degrees F. In a large saute pan that has a lid, heat olive oil over medium heat. Saute shallot, garlic and mushrooms until softened; stir in Italian seasonings and quinoa continue to cook for about 1 minute. Pour in vegetable broth and increase heat to high to bring to a boil. Reduce heat to simmer, and cover with a lid to cook for 15 minutes until liquid is absorbed. Remove from heat and allow to rest covered for 5 minutes. 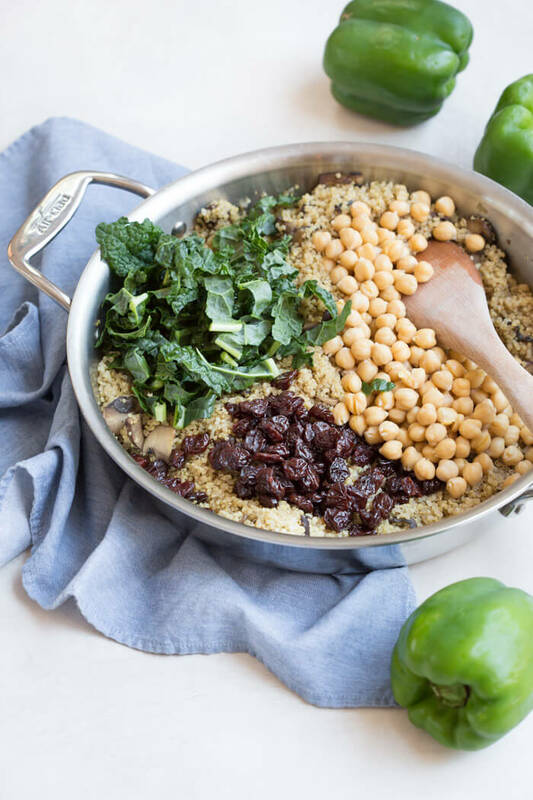 Fluff quinoa mixture with a fork and stir in kale, tart cherries, and garbanzo beans. Season with salt and freshly ground pepper to taste. Stuff quinoa mixture into bell pepper halves and place in a large baking dish or sheet pan. Drizzle stuffed peppers lightly with olive oil or coat with cooking spray. Cover with tinfoil and bake for 30 minutes. Remove foil and bake for an additional 10 minutes. To prepare the tart cherry reduction, heat tart cherry concentrate in small sauce pan over medium heat. Cook for 2-3 minutes, stirring as needed to achieve a warmed thick sauce. Once peppers have finished cooking, remove from oven and garnish with walnut halves and tart cherry reduction. Serve warm; enjoy as a vegetarian entree or side dish to a meaty main. This lovely recipe will be a nice change from my usual rice & veggies stuffed peppers. Tanks for sharing! I am loving this! So refreshing to see a stuffed peppers recipe that strays from the usual Tex-mex style. Love the garbonzos and cherries! Gotta try this one! These look yummy, I love the addition of cherries in there! I still remember making stuffed peppers for my husband for the first time as he had never had them and they were a regular dinner in my family. I love the idea of a tart cherry reduction. That sounds like a delicious flavor bomb for this healthy and delicious meal! Now this is the healthy stuffed pepper recipe I need. I could so see making these just to have them leftover for an easy lunch. These look incredible!! Love the chickpea quinoa combo for a protein boost. So pretty too! This is my kind of meal. We eat a lot of stuffed peppers – peppers are my kids’ and hubby’s fave veggie. Love all the goodness you packed in there too! So yum! “Flavor bomb” is exactly how I would describe these stuffed peppers too! Love that you added dried tart cherries! That’s a nice flavor surprise! I’m going to send this recipe to my Mum now. She LOVES stuffed peppers, but I don’t think that she ever tried making a vegetarian version. These look great! These look so dense and filling, just like a meaty stuffed pepper! This sounds amazing! These peppers look really good and very filling! 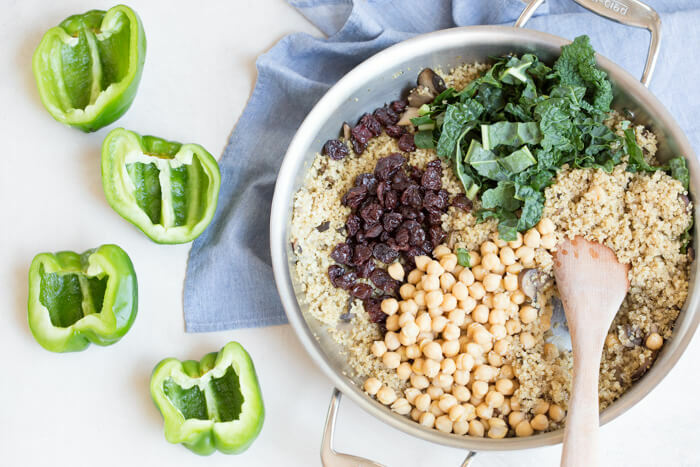 I made a similar recipe once with quinoa and dried cherries too (great mind think alike) but I really like your addition of mushroom and chickpeas! And the pictures are gorgeous! Love the idea of adding dried cherries to this! What a great pop of color and sweetness! These stuffed peppers look like they are bursting with flavor and so healthy! Can’t wait to try! These sound so delicious. I’m loving all the great vegetarian protein sources in these. Definitely want to try these! I love that you added dried cherries to the quinoa mixture. These stuffed peppers make for one healthy meal.